We kicked off early at 8am and made the short three-mile cycle to the border, where we had to pass through Kenya’s immigration to exit and separately Tanzania’s to enter. As most travellers will tell you, this is never a speedy process and the team was only ready to get going again by 10am. As I mentioned yesterday, the temperature is significantly warmer now at around 25 degrees Celsius by 11am and the delay in getting started on our longest day did us no favours. Spirits were certainly not dampened to begin with though because, no longer than 30 minutes after setting off, we saw three giraffes amble across the road, which appeared to signal the beginning of a free safari! It took us 30 miles to see the next small town on an otherwise desolate landscape, which was even quieter than yesterday and meant we saw only a few small traditional Maasai houses, the occasional herd of goats and handful of wild animals; gazelle, zebra and ostrich. If we thought yesterday’s headwinds were tough, we were in for a shock today – it was relentless. The team were fighting to reach 11mph on flats for the majority of the day, which is not particularly encouraging when you have 68 miles to cover. Temperatures reached around 30 degrees Celsius and we had to make sure we stopped for regular drinks/food breaks to keep our energy levels up. The wind continued to hurl against us as we reached the famous Mount Kilimanjaro from the west. Even after 50 miles of cycling in occasional minor sandstorms and blazing heat, ‘The Roof of Africa’ still looks as impressive and imposing as ever. By now, we had been on the bikes for over five hours and you can imagine that more than just muscles get sore by this time! 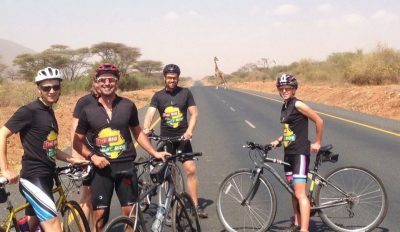 We finally got some luck for the last 10 miles when the wind swirled in our direction as we pedalled anti-clockwise to the south of Mount Kilimanjaro. Despite being tired, it felt like the team had its leashes let off and we glided into Arusha in just 35 minutes, exhausted but elated that the hardest day – or at least what we hope! – was over.